And again, thanks to our deal hunters, you can enjoy the advantages of flying with a low cost airline. Book this freshly found Orlando to Kansas City flight for $194 r/t with taxes and you will save nearly $70 compared to other airlines on such a short flight, just book your ticket in for late January 2015 with Spirit Airlines. We have found this deal provided by Cheapoair while browsing the deals of Travelgrove. Start your search there but check the prices of the other merchants as well for Orlando to Kansas City flights and book the cheapest one. Depart on your trip from Orlando International Airport (MCO) on January 13 and fly back one week later from Kansas Caity International Airport (MCI). You will have a 4 hours 45 minutes stop in Detroit on the way to Kansas City and a 4 hour 42 minutes one on the way back. Spirit Airlines Free Spirit will give you 3,172 award miles for booking this fare. Spirit Airlines is the only low cost airline flying on this route and it offers the cheapest flight from Orlando to Kansas City as well, for $194 r/t. The next best fare is a US Airways airfare for $69 more, it costs $263 r/t. 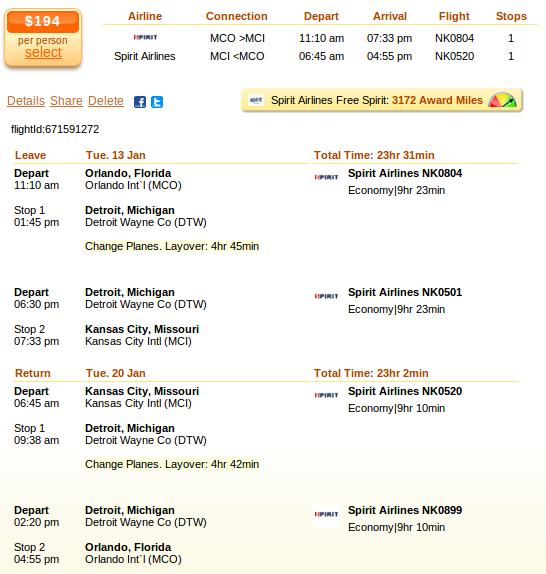 This entry was posted on Tuesday, December 2nd, 2014 at 5:39 am and is filed under Airfare Deals. You can follow any responses to this entry through the RSS 2.0 feed. You can leave a response, or trackback from your own site.